Black Hills State University is the first institution in South Dakota to receive accreditation by the Council for the Accreditation of Educator Preparation (CAEP). This means BHSU has met rigorous, internationally-recognized standards to ensure excellence in the University’s teacher preparation programs. BHSU President Dr. Tom Jackson, Jr., recently announced the CAEP accreditation and praised BHSU faculty and administrators for their continued dedication ensuring BHSU education graduates are ready to succeed as educators. Jackson noted that the BHSU program was accredited with no stipulations, a prestigious designation which confirms the ongoing commitment to innovation and progress in our education programs. CAEP is nationally recognized as an accrediting body for educator preparation. Accreditation is a nongovernmental activity based on peer review to assure quality and promote improvement. CAEP was created by the consolidation of the National Council for Accreditation of Teacher Education (NCATE) and the Teacher Education Accreditation Council (CAEP). Currently, more than 800 educator preparation providers participate in the CAEP Accreditation system. “The goal of the BHSU School of Education is to prepare students to be caring, competent and confident teachers. This accreditation recognizes the high level of quality educational experiences that can be found at BHSU, in collaboration with our PK-12 partners,” said Dr. Sharman Adams, dean of the College of Education and Behavioral Sciences at BHSU. BHSU graduates’ pass rate on licensure exams exceeds 90 percent. As a result, BHSU education graduates are highly sought by school districts in the region, nationally and throughout the world. Nearly 50 school districts have already registered to attend the annual Teacher Fair on Feb. 27 at BHSU to recruit prospective employees. BHSU is among 52 providers “meeting high standards so that their students receive an education that prepares them to succeed in a diverse range of classrooms after they graduate” according to the CAEP announcement. Black Hills State University offers 19 undergraduate and three graduate degree programs in education with unique and significant field experiences. The university is accredited by the Council for the Accreditation of Educator Preparation (CAEP) and the South Dakota Department of Education (SD DOE). BHSU has the largest teacher preparation program in the state of South Dakota, and the elementary education degree can be completed entirely onsite at BHSU-Rapid City. BHSU graduates have a more than 90 percent pass rate on licensure exams. 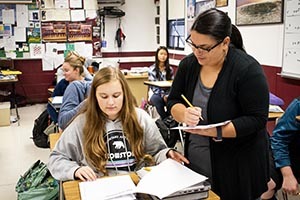 A high percentage of graduates from the BHSU education program are hired immediately in classrooms throughout the world. Nearly 50 school districts attend the annual Teacher Fair at BHSU to recruit education students.